Home Articles What if Triple H Took Over the WWE Main Roster? This speculative piece is more of a ‘when’ and not ‘if’, as Triple H and Stephanie McMahon are the obvious successors to the WWE. Triple H has proved many times that he understands the talent and the evolution of the sport, from NXT, to signings, to overall training and planning for the future. When he does take over, the changes may not be “business as usual,” as his creative style does clash from a Kevin Dunn type. Some things will not be changed due to branding and revenue (Divas back to Women, 3 hours back to 2 hours Raw etc), but the overall quality of the product will increase. On the Austin podcast, Triple H has noted that he likes slow burn storylines. This way, you do not see the members of the feud face off every week in a match, and it builds anticipation for the match at the PPV. This can be seen in multiple NXT storylines (Sami Zayn road to redemption, Balor vs. Owens etc). Another things to note is the fact that some of Raw’s talents seem directionless. Many are not involved in storylines or buildups. The tag team division also suffers from a bit of directionless booking, even though they house charismatic and skilled teams. Under the direction of Triple H, most wrestlers from top to bottom of the card will be involved in some sort of storyline or build-up. Not only that, but storylines will begin to intertwine to keep things interesting (something that has not been done nearly as much since previous eras). Triple H has always been at the forefront of the Divas Revolution. Under his leadership, the division has grown from bathroom breaks, to can’t miss matches. Going forward, the focus will shift from models to women who can actually wrestle. Granted, there will always be pretty faces in the WWE for managerial roles. Currently, it seems that Triple H & Steph already have a foothold in the Women’s division, so the change would be minimal. -Four Horsewomen continuing to headline the Divas division. -Less talented Divas regulated to managerial roles, or to Kendrick for further training. -Additional women brought from Shimmer & Shine to continue the thriving NXT women’s division, to then transition to the main roster. -Limit face & heel turns. Have storylines actually matter, and that continue until blow-off matches. Currently, the tag team division is quite directionless. 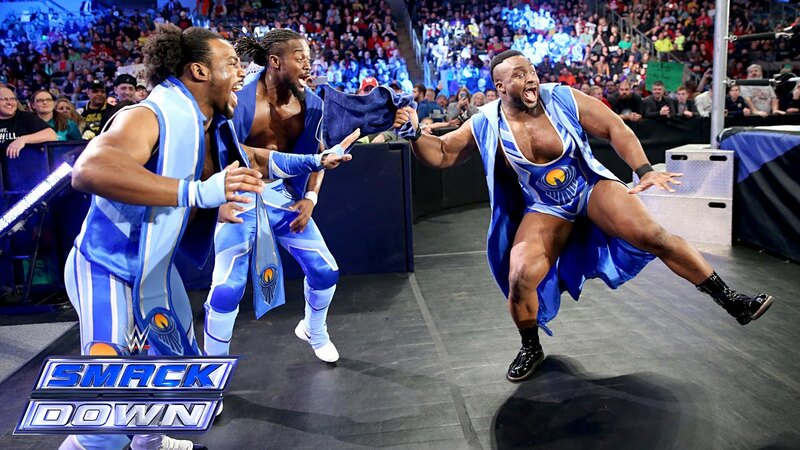 The New Day, The Usos are both talented and charismatic. The PTP are very charismatic, and Los Matadores/Lucha Dragons/Ascension/Wyatts are talented in the ring. Any time they try to fit more than one team in a feud, it becomes a typical fatal 4 way tag match. Triple H would bring stability back, creating a hierarchy back to the division. Having one team at the top, and the rest of the teams fighting among each other for the #1 contender spot. Real feuds can take place from top to bottom. The NXT tag division has had some fluctuations, but they are at least consistent with clear-cut storylines. On top of that, Triple H is clearly willing to bring in outside sources for a few matches (Jushin Liger, Brian Kendrick, Rhyno etc. ), so we can expect some teams to return for quick appearances to enhance some talent. -Ascension back to their NXT attire and more dominant ways, Los Matadores back to their roots, and elevation of new teams on their eventual way up (Gable & Jordan, Cass & Amore etc). -Two matches per Raw involving tag team division. One with the titleholder/contender, the other with two feuding teams. -Clear cut ways to create #1 contenders: Battle Royal, Tournament etc. The midcard has served as the launching point for some stars, and the slow decline for others. Triple H has focused on building stars in NXT, which would translate to the main roster. An increased emphasis in in-ring talent will take a foothold in the midcard. The men that look to have great skills in and out of the ring would be holding the titles, coupled with fantastic feuds. While John Cena has done a great job elevating the US title, someone will eventually have to win it from him and keep it elevated. -Finn Balor/Sami Zayn/Neville/Tyler Breeze/Barrett/Rhodes etc. to begin picking up wins and entering, meaningful intertwining feuds. Any star(s) that rise from the pack to be elevated to the main event scene. -IC title to be elevated with headliner-type matches, similar to the days of Ricky Steamboat or Mr. Perfect. Cesaro vs. Owens would be a great way to kick something like this off. -One-off and part time superstars to enter this area to help elevate the younger stars. This division was once a place of comedy, which still has a place on the roster. While guys like Slater and Fandango do not have a place in a headliner matches, but they can still be put in comedic storylines. From Al Snow & Blackman, to Steven Richards vs. Val Venus, to Haas & Rico, there used to be a time where even the lowest members had something going on. Triple H has noted in interviews before that this was how they did things at one point, and he misses it. He has also reinvented his “jobbers” on NXT and gave them all a chance (Bull, Dillinger etc). This is good news for the forgotten members of the roster. It also opens up for a “lovable loser” who overcomes the odds and stars going on a winning streak and makes their way to the midcard. -Provides direction for Swagger, Rose, Fandango, Slater Bo Dallas etc. Any star(s) that shines in the pack to be elevated to the midcard. -Pairs up two of the men in a “mismatched” fun tag team that makes a legitimate run for the tag titles eventually. -Provides the up and coming midcard guys a platform by jobbing out, but not feeling like a complete throwaway. The main event scene is truly the lifeblood of the WWE. These people are designed to fill seats and sell subscriptions and merchandise. This is perhaps why John Cena is continually used to take this spot. Although the Vince regime has been getting better at building stars (Reigns, Ambrose, Rollins, Bray), they seem to still fall back on part timers and former main eventers for the bigger shows. Don’t count on Triple H to remove the part timer main event scene just yet (as he was high on the Sting match, and will likely put himself in a match with the Rock at WM32). One thing we can count on is the official passing of the torch. The main event scene of the attitude era (and to an extent, the Ruthless Aggression era) was filled with multiple credible contenders for the title. Just as one person was exiting the scene, there was another to fill the spot.